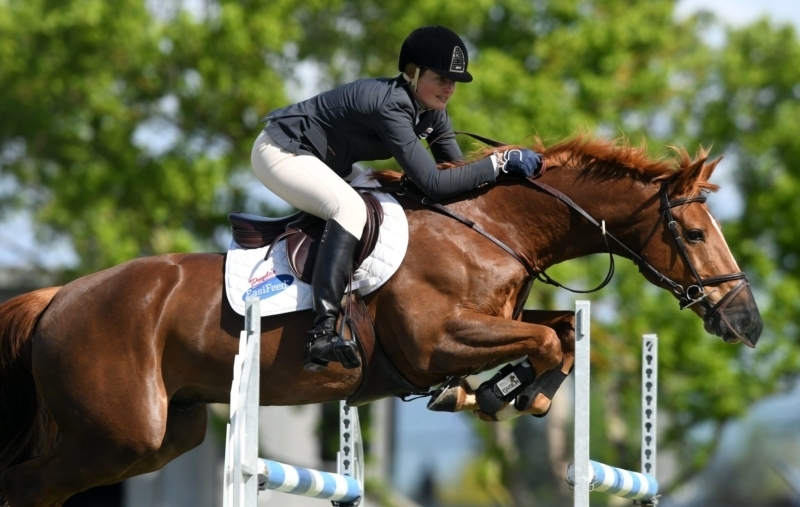 Chloe Hansen has won plenty of classes over her many years of competing, but her victory in the Dunstan Horsefeeds and EquiFibre Horse Grand Prix at the Feilding IAP February Show was more than just a little special. She and Kiwi Motto were the only ones of 12 combinations to go clear in the opening round of the Gary Sinclair-designed course. And while Harty – as Kiwi Motto is generally known – is a superstar in the show hunter ring, with six HOY crowns to his name, this was his first ever grand prix win. Making it even more special was that the last time Hansen won a horse grand prix was around a decade ago aboard Dolly. “The longer you persevere with this sport the more you realise how hard these classes are to win and it makes all the hard work worthwhile,” said Hansen. She and Harty were 10th to go in the field. And the 16-year-old horse knows that if his doting owner thinks he can jump something, then he must be able to. But the indoor at Feilding suited Harty, who has been with Hansen since he was six. She’s hopeful her horse will “keep going forever”. Next on their schedule is Takapoto Estate Show this weekend, then a little break before HOY where she would dearly love a ribbon in the Lady Rider of the Year. Her last start in the prestigious class was in 2010 and it didn’t end well. Beatson (Dannevirke) was the best of four faulters to take second on Gold Locks, with Daniel Webb (Hunterville) and Cardo third with Doug Isaacson (Dannevirke) on Elmo fourth. In the Country TV Pony Grand Prix three of 18 combinations came through to the jump-off. There is was Parys Marshall (Taranaki) and Spot You Later who shone with their four fault round, coming home in 39.08 seconds. Second placed Lily Moore (Hastings) and Showtym Highlight had eight faults in 35.15 seconds, with Katie Bridgeman (Auckland) and Mr McCloud coming in for third. Dunstan Horsefeeds and EquiFibre Horse Grand Prix: Chloe Hansen (Palmerston North) Kiwi Motto 1, Maurice Beatson (Dannevirke) Gold Locks 2, Daniel Webb (Hunterville) Cardo 3, Doug Isaacson (Dannevirke) Elmo 4, Oliver Croucher (Rotorua) Kiwi King 5, Maurice Beatson (Dannevirke) Mandalay Cove 6. Country TV Pony Grand Prix: Parys Marshall (Taranaki) Spot You Later 1, Lily Moore (Hastings) Showtym Highlight 2, Katie Bridgeman (Auckland) Mr McCloud 3, Ally Stevenson (Hastings) Tallyho Madonna 4, Lily Carpenter (Taihape) Tallyho Mystic 5, Sarah West (Matamata) Miss Mae West 6. FMG Young Rider Series: Blake Davis (Palmerston North) Giggles 1, Mikayla Herbert (Rotorua) Grand Caballo 2, Hannah Fraser (Bulls) Vendange and Nicholas O’Leary (Wanganui) Obeone Kanobe =3, Ike Baker (Pauatahnui) Hawkesdale Mahe 5, Parys Marshall (Taranaki) Alejandro 6. Caledonian Holdings Amateur Rider Series: Dana Sutton (Palmerston North) Down Wind 1, Caroline Richardson (Wairoa) Peggy Blue 2, Merran Hain (Gisborne) Untouchable 3, Marcus Rose (Dannevirke) Kaipara Hold Up 4, Kaleigh Kent (Otane) Double J Sponge Bob Square Pants 5, Tarnia Morris (Taupo) Blackhawk 6. Dunstan Horsefeeds and EquiFibre Junior Rider Series: Sarah West (Matamata) ERL Grey II 1, Ike Baker (Pauatahanui) Vidal NZPH 2, Amy Moore (Rotorua) Waitangi Wi Fi 3, Samantha Carrington (Takapau) Double J Breeze On 4, Amy Gibbs (Marlborough) Soho 5, Emmie Mulinder (Havelock North) Roxborough 6.